Why do you think people would be interested in your life-story, given that you’re not exactly a celebrity? I’m not a household name, true, and can’t claim to have been the greatest mover and shaker. But I’ve seen and experienced at first-hand some of the very significant happenings and developments in the churches and the world of my lifetime. It’s these and the people who’ve been involved in them that I’ve wanted to highlight in fresh ways, from my personal perspective, quite apart from anything I myself might have done or influence I might have had. You describe your story as “an ecumenical life”. Just what does that mean? “Ecumenical” comes from the Greek Bible, meaning “the whole inhabited earth”. When I was a student, what really turned me on to active Christian faith was the movement for Christian unity which meant removing the barriers between Christians and churches everywhere, enabling us to work together for the healing of a world wounded by nationalism, racism, poverty, and militarism. It was an exciting, hope-filled vision! I’ve tried to be faithful to it ever since, even though it’s not as popular as it was fifty years ago. So, what are those “significant happenings and developments” that feature in your story? On the big scale, things like the Cold War to the fall of the Berlin Wall; the struggle against apartheid in South Africa; conflicts in the Former Yugoslavia, in Rwanda and Burundi, and the growth of a more united and integrated Europe. Above all, what has engaged me is the involvement of the ecumenical fellowship of churches in these issues as well as in the search for greater Christian unity. Parts of the book may read like a travelogue rather than a book of theology, but it’s the actual encounters with people, both the good and the great (and the not so good) and so-called ordinary people which has taught me so much—about hope. And what about the smaller scale of your life—how personal does it get? Pretty personal at times, from my struggles to find a faith during my student years, right to very recently when for the second time both I and my wife were diagnosed with cancer. I have to admit that this was one of the spurs to writing the memoir—while there was still time! But I don’t want to make too big a noise about that. 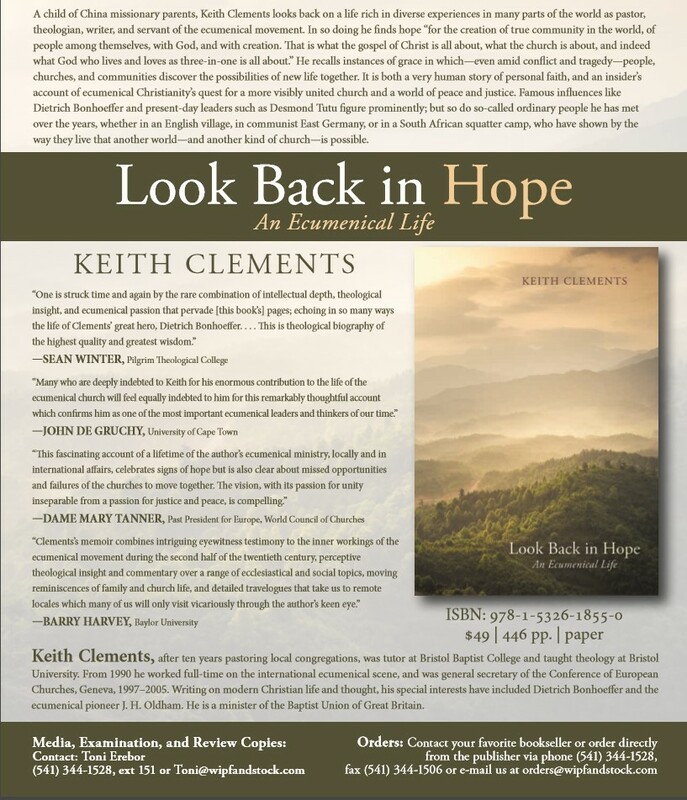 The real challenges to hope have come from disappointments in later years, like the slowness—or even going into reverse— of the ecumenical movement and the British vote to leave the European Union, both of which I believe are symptoms of a growing and dangerous self-centredness in western life as a whole. You describe not only disappointments but also some pretty grim scenes, yet you still keep “hope” in your title. How is that? What I’ve tried to show, is that people and communities even in the direst situations, when touched by grace and the Spirit of Christ, are capable of the most extraordinary ventures in love, for peace and justice and reconciliation. I can’t believe that the Spirit who inspires such actions will ever give up. There will always be chances of new breakthroughs to community, even in a world of extremists and fundamentalisms. So I look back—and then forwards—in hope. So, who is your book really for? I would say, it’s for the reader of whatever persuasion or none, who is curious to know just what makes a person of my kind of Christian faith tick in the contemporary world. Time and again I’ve come across people, usually in pubs or planes or on trains, who are intrigued (and often encouraged) when I tell them what I’m involved in, and want to know more. “I never knew the church was trying to do something about that”, they say as they recite the catalogue of world events that alarm them on their TV screens. Who are the people who’ve really inspired you with hope? There are far too many to name right here, but certainly great figures of modern times like Dietrich Bonhoeffer who features prominently in the book, and people I knew personally like John Daries, a black South African Baptist who could laugh and joke even when telling of his ill-treatment under arrest. Or my own parents whom I always thought of as optimists, as my account of our wartime journey from China shows. But fundamentally of course it is Jesus Christ himself who inspires hope by his life, death and resurrection, and the gift of his Spirit. Is anything you say in the book likely to cause offence? I hope so—in the sense that for example towards the end I’m pretty critical of the contemporary British churches’ lazy attitude to ecumenism, and their virtual abdication of a joint responsibility towards big issues like Europe. I think they’ve succumbed to the contemporary obsession with “identity” at the expense of action for the common good and greater unity among themselves. So I hope and pray for a re-kindling of the vision that inspired me over half a century ago. You’ve dedicated the book to your grandchildren—any special reason for that? It’s simply that they most obviously represent the future. Bonhoeffer once said that the question a responsible person asks is “How will the coming generation live?” My wish is that as part of their coming of age my grandchildren and their generation will have something from which to draw hope, as they ponder whatever we have learnt for our good in our time.